Lebanon is the town near which the Men of Letters Bunker is located. It is the geographic center of the lower 48 contiguous United States. Some type of phenomenon shields activity in the area from Heaven, making it "muddy" for the angels. An old house on Route 36 where the local kids party. In 1958, Larry Ganem is one of the elders of the Men of Letters chapterhouse in Normal, Illinois. Abaddon massacres the Illinois chapter while trying to obtain the key to the Men of Letters Bunker, which he gives to Henry Winchester for protection. Henry uses magic to create a portal which takes him to the year 2013, but he is unknowingly followed by Abaddon. 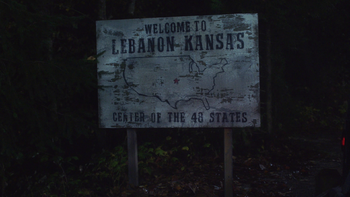 Henry finds Sam and Dean and they manage to locate Larry Ganem, still alive, in Lebanon, Kansas. He gives them the coordinates to the Bunker but he pleads with Sam to lock the key inside the Bunker to prevent Abaddon gaining access to the knowledge kept there. When Abbadon locates Larry, she possesses his wife and kills him, while she takes Sam hostage. In an exchange with Dean for the key, Henry is killed, but not before he is able to shoot her in the head with a devil's trap bullet which locks Abaddon into her meatsuit, allowing Dean to decapitate her and ensuring she is trapped in the body. In the aftermath, the Winchesters take the key and decide to find the Bunker. Sam and Dean are able to locate the Bunker built beneath the foundation of an abandoned power plant. After exploring the underground lair, the Winchesters decide to move into the Bunker and use its contents to aid in their battle against evil, effectively turning it into their home. Sam and Dean hunt down a banshee that has been causing the residents of a retirement home called Oak Park to kill themselves. The home is 15 minutes from the Bunker. In the alternate timeline, Eliot and his friends are having dinner in an Italian restaurant when Zachariah and Castiel arrive demanding answers for who messed with time. Zachariah and Castiel threaten to kill everyone within before Sam and Dean intervene, sending everyone away before killing Zachariah and banishing Castiel. This page was last edited on 18 February 2019, at 16:05.